ESA's Guido de Croon demonstrates new AstrDrone app. The European Space Agency wants Parrot AR.Drone owners to help teach robots about docking in space. The ESA has launched a free augmented reality app for iPhone and iPad called AstroDrone that lets players "see" virtual objects, such as a replica of the International Space Station, and practice docking their drones to the station. This new AstroDrone app is part of a scientific crowdsourcing project by ESA's Advanced Concepts Team; the project will be gathering data to teach robots to navigate their environments. The idea is to capture how people intuitively assess position and motion, then reproduce the capability with artificial intelligence. The ESA team built an app with Parrot's open source code, which Parrot uses in AR.FreeFlight, the app that controls its drones. Players use a marker that comes with the AR.Drone to tag an object that will be the International Space Station in their game. The goal is to dock as quickly as possible, with bonus points for correct orientation and low speed on final approach. Players can then submit their high scores to ESA through the app. This video shows how the AstroDrone app works in a space station environment. Submitting scores also allows ESA engineers to capture data from players' successful flights, using image information recorded by the drone. Combined with other flight-specific figures, such as velocity and angles, engineers will be able to learn more about smart docking maneuvers. All data will be anonymous, ESA said. 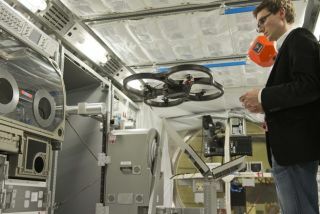 "We can obtain real-life data to train our algorithms, in large amounts that would practically be impossible to get in any other way," Guido de Croon, one of ESA's team members on the AstroDrone project, said in a statement. The AstroDrone team is working on versions for other platforms, such as Android. The team will also expand the simulations to include rendezvous scenarios with ESA's Rosetta probe. This story was provided by TechNewsDaily, a sister site to SPACE.com. Email Leslie Meredith or follow her @lesliemeredith. Follow us @TechNewsDaily, Facebook or Google+.